If there’s one buzzword that resonated in 2009, it has to be Twitter, so it’s fitting that I’m ending the year with a podcast about Tweets. The week of December 14th I was in charge of Wired’s massive 325,000 follower account (@Wired), so I want to tell you the 10 lessons learned, and break down writing the perfect tweet. When we first started tweeting, I had every intention of taking my turn as one of the ‘gatekeepers.’Â But the first time I asked, I was out of the office for a few days, so I declined. Then I think that happened again the next month. Before I knew it, the awesome editors at Wired were on a roll and hitting it out of the park each week, so who was I to interfere? – When I use my personal Twitter account or post on Facebook, I’m reaching about 500 people. If you mess up or say something stupid, it’s mostly your friends. Probably something they’ve heard before. – When I send a tweet from @HopkinsonReport, it goes out to almost 2,000 followers. Still a decent number, but I’m pretty good about keeping it marketing-focused. – Even on Wired’s Facebook page of 50,000, it’s not too bad as it’s just a major story or two that we link to during the day. 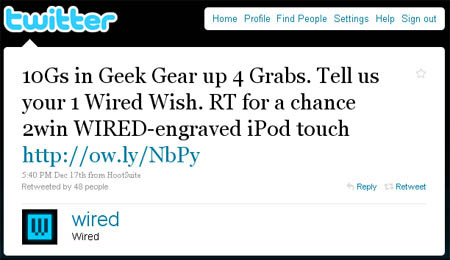 10 lessons learned from the tweets I sent from Wired twitter account. Wired had already set this precedent a bit. I updated the bio to show that I was the one tweeting that week, and sent out an introductory message. One of my first tweets was one of my best. What better topic at this time of year (holidays + recession) than to talk about a HUGE BONUS. It was with this tweet that I also started to find my voice, mixing a question/statement and then the headline. This got at least 1,853 clicks, good for 4th most all week. Shocking… stories about Facebook on Facebook do well, and stories about Twitter on Twitter do well. I used my statement+headline method again. On that Monday, there was a lot of excitement here in NYC after we were announced as AdWeek’s Magazine of the Decade. The marketing group was buzzing, the sales team was beaming, Wired rang the closing bell at NASDAQ, and we did a Wired spine contest. But when it came time to tweet it, I followed the wise words of Gadget Lab editor Dylan Tweney (@Dylan20). Be humble.Â Yes, we are proud, and yes, we work really hard. But we’d be nothing without all the great fans. 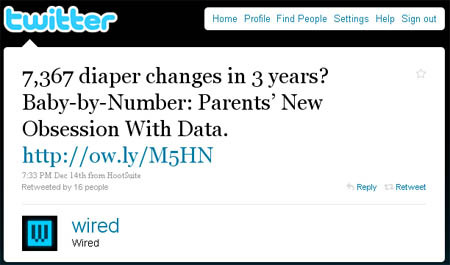 When I read the story “Baby-by-Number: Parents’ New Obsession With Data” I knew that would be a good one. But the title needed something more. Knowing that new parents are basically on a treadmill of feed baby—change baby—sleep 2 hours—repeat, I knew some of the hard stats from the article would really make this tweet jump out. And that it did… 1,100 clicks. Lesson 7. Short and sweet works too. And lists. And spotting a trend early. I put up the very simple 7 word tweet of “Best of 2009: Top 5 Wii Games” and it did great.Â Best of?Â Gaming news?Â Keep going back to the well. Lesson 8.Â Weekends work too. This one actually surprised me a bit. 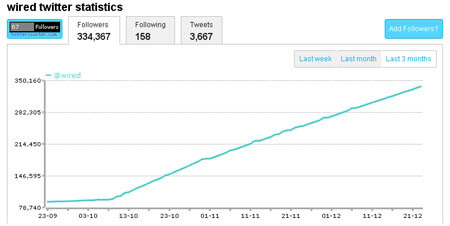 Wired gets far more traffic during the week, so I figured that trend would hold true on Twitter as well. Not so.Â I scheduled a holiday shopping related tweet to go out early Saturday afternoon, but it was “18-Gigapixel Panorama Offers Breathtaking View of Prague” that ended up as the 2nd most clicked story of the whole week, with more than 2,500. Lesson 9. Be a little risky and daring. By Thursday, I was feeling more confident when I came across the holy grail… a Star Trek story involving women and science. Star Trek/Star Wars is always gold. Now I just needed a good lead.Â Phasers to stun?Â A Captain Kirk Reference?Â I wanted to shock, so I went with Spock (1,300 clicks). Lesson 10. Watch for the perfect storm. Apple + MacbookÂ + Airport Security + Photos + Bullets + Triumph over Evil?Â This isn’t just a story, it could be Cameron’s next movie. How to phrase it?Â Wham Bam, thank you… nope, a little too risque.Â Lets go the geekier angle instead. Result: 4,000 clicks. Step 5. I thought the fact that the iPod was Wired-engraved was cool, so I added that. Didn’t want to, but removed the word “please.” Felt that this wasn’t so much asking a favor (please retweet this) as a command (you need to retweet this for the chance to win). Step 6. Need some more space, so change “for” to “4” and “to win” to “2win.” Added caps on WIRED. Added url to see how long that was. Definitely made sure there was room to reweet… wasn’t just that we want people to retweet… it was an essential part of this.Â Test everything a few times. Step 7. Make sure to do the follow-up and keep your promise. The next day, picked a winner that had retweeted it and reached out to him. Sent him his prize. He retweeted that he won. End result was a very good number of clicks and retweets. BTW… the contest goes until Feb 2, 2010, so hey… Enter to win $10,000 from Wired. -Â Having a huge audience was a little bit daunting at first, but I quickly settled in and found my voice while staying true to the Wired brand. Know your limitations and just take a little more time. -Â Don’t be afraid to go through a few rounds of copy. -Â I had one major change in talking about twitter and social media. The selling points I was telling people all year were: It’s free, it works (we’re getting more traffic),Â it’s fun and interactive, it doesn’t take a lot of time. Well, I’m ready to rehash that last point a bit. 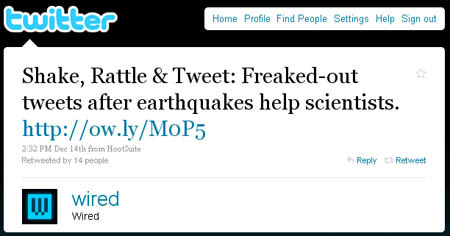 Yes, you can quickly find a story and tweet it in a minute. However, I found myself taking more time looking for the breaking trend or hot story, time making sure it was accurate and hadn’t been mentioned before, more time crafting the tweet and testing it, and more time analyzing (ok, obsessing a bit) over all the cool stats you can glean from what you’re doing). So maybe it doesn’t take a TON of time, but let’s just say you can spend a lot of time on it if you let it. In looking at the early returns from my survey, the one thing that was clear is that most people heard about me from a friend. So if you enjoy the content that I’m producing, please pass it on to people you know who might like it as well. 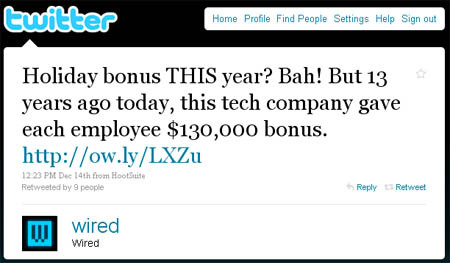 This entry was posted on Wednesday, December 23rd, 2009 at 3:21 am and is filed under Branding / Advertising, Marketing Case Studies, Social Networking / New Media, Twitter. You can follow any responses to this entry through the RSS 2.0 feed. Both comments and pings are currently closed.